Herbs are a comforting presence in winter. It most likely has to do with the fact that they have been used for centuries to relieve all kinds of ailments, especially for those related to winter chills and ills. Thyme (Thymus vulgaris) is the prince among winter healing herbs. It strengthens the lungs and can be used to alleviate cold related coughs, bronchitis and whooping coughs. It can be used fresh, as a tea or tincture. Fortunately it grows easily and is readily available. Parsley (Petroselinum crispum) is another herb that is abundant in winter. It can be used to relieve fevers, bronchitis, conjunctivitis, coughs, and joint pain. It is also a good source of vitamins A and C, which support the immune system. Fresh chopped parsley can be used as a garnish, added to food at the end of cooking or made into a soothing parsley tea. Calendula officinalis is a cheerful winter annual that likes full sun. The petals of its yellow or orange flowers have antiseptic, anti-inflammatory and cleansing actions and can be used as a wash to treat fungal infections. Sage (Salvia officinalis) also has anti-fungal and antiseptic properties and although its growth slows down in winter a sprig can be used to make a gargle that soothes throat and mouth infections. The leaves of Viola odorata tend to die down in winter but while they are in supply they can be chewed to relieve a headache or infused and used as an anti-inflammatory expectorant, especially in case of whooping cough and acute bronchitis. They also help to lower fevers and cleanse toxins out of the system. Hyssop (Hyssopus officinalis) is an excellent herb for helping in the treatment of bronchitis because it loosens mucus and soothes membranes. It is not that palatable on its own but combines will with thyme for bronchial congestion, with peppermint and yarrow for the common cold and lemon balm for cold sores. Finally, don’t forget about rosemary (Rosmarinus officinalis). It aids recovery from chronic illness, because it is thought to stimulate the adrenal glands. It also has an uplifting effect that’s useful for mild to moderate depression that often accompanies illness. There are a number of ways to extract the goodness of the winter healing herbs. Herbal teas, or infusions, are the easiest to make. Use two teaspoons of fresh herb to one cup of water. Put the herbs in a cup or teapot and add water that has just boiled. Leave to steep for 10 to 15 minutes, then strain and drink. Honey can be added. Teas can be drunk hot or cold and are usually taken three times a day. A tincture is stronger than an infusion and alcohol, or apple cider vinegar, is used to extract the herbal constituents. The alcohol, usually vodka, also acts as a preservative which allows the mixture to be kept for up to 18 months. Being stronger, smaller quantities can be taken at a time and it is easier to use when travelling. To make, put 300g of fresh, chopped herb into a glass jar and cover with one litre of alcohol, either vodka or rum. Close and label the jar and store it in a warm place, but away from direct sun for two weeks. Shake the jar every day. After two weeks strain the liquid and store it in a dark glass bottle and label with the herb and date. A teaspoon of the tincture is diluted in water (±125 ml) when used. 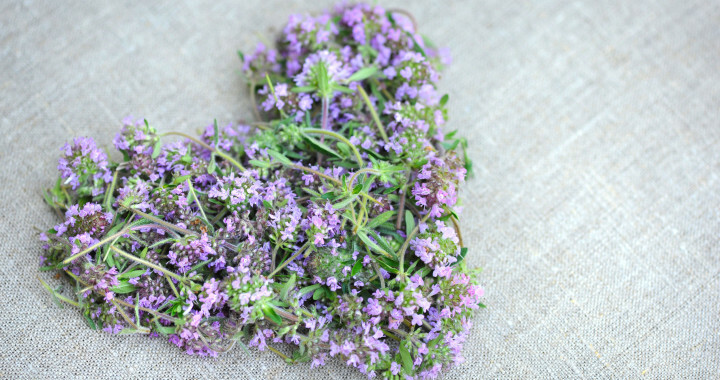 Homemade cough syrup using an infusion or tincture of thyme or hyssop and honey. Honey acts as a preservative and also has a soothing action that helps to relieve a sore throat. The sweetness disguises the taste of the herbs making it more palatable for children. Posted in Healing Herbs and tagged health benefits, herbs, recipe, tea, tips.